Making accommodations for our struggling learners is a no-brainer. We’ll do whatever it takes to make learning easier for our kids. However, sometimes we’re guilty of overlooking the simplest things in an effort to figure out what our kids need. That’s exactly why I put together this list of simple modifications that every teacher (homeschoolers included!) need to be introducing. While these are designed to help struggling learners, EVERY child can benefit from these. And, the very fact that they are easy to implement makes them even more enticing! One of the most effective tools you can have in your home or classroom is a highlighter. The fact that they help to focus attention on a specific letter, word, sentence, or symbol is the exact reason I use them to help learners who are struggling. If reading words or sentences is difficult for your kids, designate a specific highlighter color for the beginning, middle, and end. This will help them distinguish where to begin reading and where to end. This is a particularly helpful tool if you are concerned that a child might have dyslexia. By helping the child correlate the beginning of a word with the “yellow” color, they have a consistent starting point when reading. This is imperative given their brains are saying otherwise. Hopefully, this easy modification gives them an effective tool to overcome a potentially lifelong struggle. To prove how effective this tool is, I actually made my son use highlighters last week to help him with his math. He is working through Algebra 1, and he was struggling to figure out where to start on a math equation. So, I had him highlight what he needed to do first with a yellow highlighter. Then when he completed the first step, he highlighted the next step pink. This helped him focus on each piece of the equation as he needed to, and it reduced the stress he was feeling with the lengthy problem. You see, I know what I’m talking about because if it hadn’t been for highlighters, I might not have passed geometry. Seriously…I’m not joking. Remember, it isn’t necessarily the highlighter itself that’s essential. It’s the fact that you’re helping a child pinpoint the most important thing by underlining, highlighting, or circling that makes this accommodation so effective. If, for some reason, highlighters aren’t available, colored pencils or crayons are just as good. If a child can effectively complete 10 problems correctly, there’s absolutely no need for them to finish 25. And this is even more important for struggling learners. Obviously, every child needs practice with new skills. However, an assignment that would take 15 minutes for a student who understands the material might take your struggling learner 2 hours. That’s why shortening assignments is so helpful for them. It allows them to practice the new content without getting overwhelmed by the length of the assignment. Jennifer, don’t make a mountain out of a mole hill. While I hated hearing those words, he was right. I was so focused on the length of the assignment that I didn’t even realize that if I just took one problem at a time, I would be finished in no time. 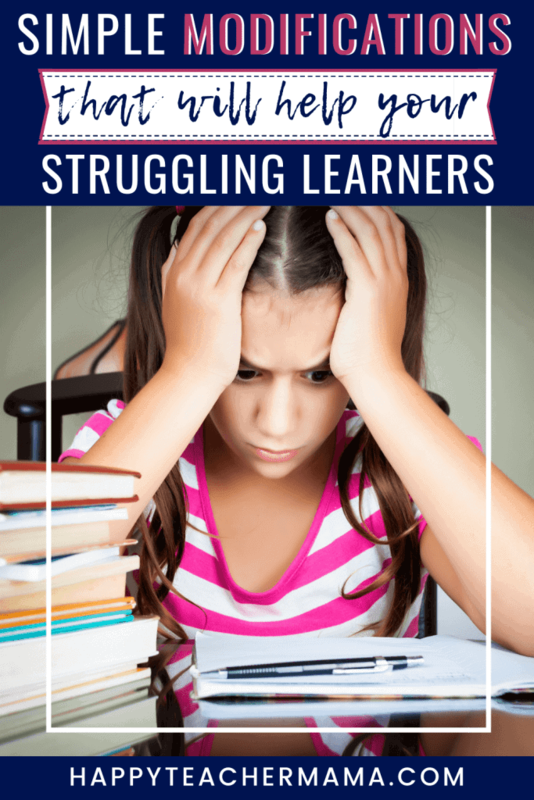 Unfortunately, our struggling learners really do have a mountain to climb. Not only is the assignment long, but it takes them a really long time to even complete one problem. So, do them a favor and simply shorten the assignment. They will still learn the necessary information, but the stress associated with the length of the assignment will diminish. On standardized tests, kids are given texts that they can (and are encouraged to) refer back to when being asked specific questions. There is no better way to prepare them for finding text evidence than letting them practice this skill on unit or weekly tests. It takes a lot more effort to go back and try to find the information in the text than it does to just circle any random answer. While every test doesn’t have to be an open book test, allowing kids to use their text often will actually strengthen their abilities to perform better on standardized tests. For your struggling learners, the same rules apply. Many schools today don’t have enough textbooks for all of the students. Other schools simply don’t allow kids to take textbooks home. This makes studying exponentially harder…especially on parents who are genuinely trying to help at home. Make copies of textbook pages that are relevant. Create a handout with important information you want parents to reiterate at home. If you have your own curriculum or tend to use a variety of teaching tools, give students (and parents) links to helpful websites for that particular subject matter. The last helpful accommodation I want to mention is the index card. I can remember my high school Chemistry teacher letting us use one index card on our tests. We weren’t given any specific directions as to how the information had to be formatted. We were simply told to include anything we thought was important. Of course, in the beginning, I felt it my civic duty to write as small as humanly possible in an effort to write EVERYTHING. Over time though, I discovered that if I included formulas, pertinent elemental information, and constants that could be applied to many questions, my card was much more valuable. Through this experience, I discovered the value of condensing the information into its most basic parts. And this is the skill that has helped me so much over time…even more than the actual index card. The same application can be made by our elementary kiddos. In essence, they are learning how to create their own anchor charts. We are modeling how to find the most essential pieces of information. Then, the card becomes a “lifeline” or “cheat sheet” during testing. All kids whether they struggle or not, should have the opportunity to apply little “tricks” that will help them as they learn. That’s basically what modifications are intended to be. Accommodations are not meant to be used as ways to “get out of doing work.” They are designed to help our struggling learners discover ways to learn in manageable ways.